The Cytopro Rotor allows you to turn your Aerospray® stainer ito a full-featured cytocentrifuge system. The Cytopro is truly simple to load and unload chambers and it is autoclavable for complete sterilization. 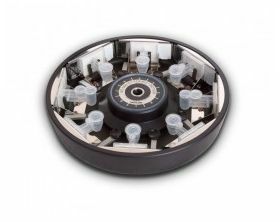 You can also use this advanced rotor in most Shandon Cytospin systems with purchase of the Cytopro Adapter (AC-080). 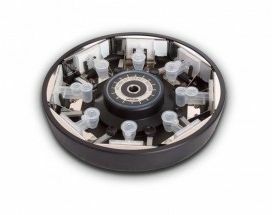 The Cytopro Cytocentrifuge Rotor is an accessory for the ELITech Biomedical Systems stainers that deposit an enriched monolayer of white cells onto microscope slides. Compressed flow control ring in the Cytopad® yields the highest cell recovery in the industry. Automatic pad alignment. Parts snap together easily and correctly every time. Convenient pre-wetting port for increased and more consistent cell yields. Superior clamping mechanism for consistently reliable performance. Sample protection cutout for trouble free chamber removal. Smooth and positive push-lever chamber retraction. Fast and easy loading and unloading. Compact, lightweight rotor for ease of handling, storing and transporting. Shallow rotor profile for easy access. Slide label visible during sample loading. Generous 7 mm sample display area (36% larger than the 6 mm Shandon Cytospin™ single). Choice of fast or slow absorption pads. Choice of single or double chambers each giving the same excellent results. Choice of large volume Cytopro Magnum chambers where the suspension fluid is automatically absorbed at the end of the run. Using the Wescor Hub Adapter (AC-080), the Wescor Cytopro rotor can be used on the Thermo Shandon Cytospin® 2, 3 or 4.